25 September 2018–The seasonal filling and emptying of reservoirs in India can cause measurable deformation of the surrounding rock, reducing the strength of nearby faults and potentially triggering earthquakes, according to two new papers published in the Bulletin of the Seismological Society of America. Researchers in India used global positioning system (GPS) observations along with satellite-based radar data called InSAR to track the movement—particularly the uplift and subsidence—of rock layers around the reservoirs. 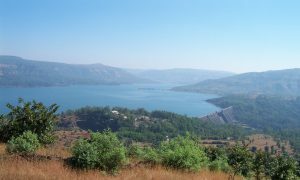 The teams measured crustal deformation around the Koyna and Warna reservoirs in western India, as well as the Tehri, Ukai and Dharoi reservoirs in India. The studies are included in the journal’s special issue on reservoir-triggered seismicity around the globe, 51 years after a magnitude 6.3 earthquake in the Koyna-Warna region of India became the largest seismic event ever attributed to reservoir filling. Occurring in a region where there had been no previous record of significant seismicity, the Koyna earthquake caused 180 deaths and more than 2000 injuries, and thousands of smaller earthquakes still impact the region today. Reservoir-triggered seismicity is thought to be the result of shifting water levels in the reservoirs impounded behind the dams, which may increase stresses on faults by altering the stress and pore pressure in rocks along the fault. Reservoir filling accounts for 23 percent of the total number of earthquakes caused by human activity, according to the Human-Induced Earthquake Database. 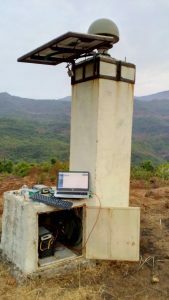 Vineet Gahalaut of the National Center for Seismology in India and colleagues used data collected by five Koyna-Warna GPS stations since 2013, along with InSAR observations, to learn more about the underlying tectonic movements in the region. The researchers found that the eastern block of the Koyna-Warna fault zone appears to be moving faster to the northeast compared to the western block, a motion that may be increasing stress on faults in the region. “It is inferred that seasonal deformation due to reservoir water level changes leads to a reduction in the strength of the critically stressed faults in the Koyna and Warna seismic zones, leading to triggering of earthquakes,” said Gahalaut. A reservoir can have a stabilizing or destabilizing influence on nearby faults, depending on the kind of slip along those faults and where they are located with respect to the reservoir. In a second study, Gahalaut and colleagues quantified crustal deformation related to seasonal filling at Koyna and three other reservoirs in west central and central India: Tehri, Ukai and Dharoi. The reservoirs are located in different geological zones and are of varying sizes, offering the researchers a chance to look for potential variation in deformation caused by reservoir filling. They found that even the smallest reservoir—Dharoi at 0.9 cubic kilometers (roughly equivalent to 730,000 acre feet) could cause deformation capable of triggering an earthquake—if there are critically stressed faults in the region. Gahalaut said more GPS observations gathered over longer periods of time will help to quantify the deformation rate around Indian reservoirs, which in turn could help refine our understanding of triggered earthquakes. He said it will also be important to collect more information about the surrounding crustal structure, including changes in the thickness and rock types around the faults, to fully understand how reservoir filling may trigger nearby earthquakes.